(Geneva Centre) - The Geneva Centre for Human Rights Advancement and Global Dialogue (“the Geneva Centre”) was invited by the Secretariat of the Human Rights Council (HRC) to participate in the first informal exchange of views on the issue of the 2021/2026 review of the status of the Human Rights Council. (Geneva Centre) – At the 40th regular session of the UN Human Rights Council, the Geneva Centre presented on 14 March statements with regard to Saudi Arabia and Jordan. 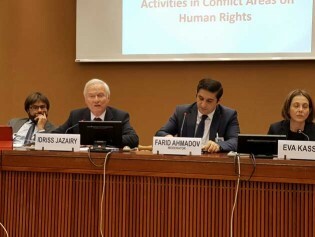 (Geneva Centre) - On the occasion of the 2019 World Day of Social Justice observed on 20 February, the Executive Director of the Geneva Centre for Human Rights Advancement and Global Dialogue Ambassador Idriss Jazairy stated that the promotion of international solidarity and social justice are vital to the building of peaceful and inclusive societies. (Geneva Centre) - A new publication entitled “Women’s Rights in the Arab Region: Between Myth and Reality” has been released by the Geneva Centre for Human Rights Advancement and Global Dialogue. On 15 September 2017, the Geneva Centre organized a meeting on the same theme in cooperation with the Permanent Mission of the Arab Republic of Egypt at the United Nations Office in Geneva. It was held as a side-event to the 36th session of the UN Human Rights Council. (Geneva Centre) - In a letter to the UN Secretary-General António Guterres signed by HRH Prince El Hassan bin Talal of Jordan, the General Secretary of the World Council of Churches Reverend Dr Olav Fykse Tveit and the Executive Director of the Geneva Centre for Human Rights Advancement and Global Dialogue Ambassador Idriss Jazairy, the co-signatories appealed to the UN Secretary-General to contribute to the peaceful resolution of the matter concerning the Pakistani Christian woman Asia Bibi. On the occasion of the 2018 World Arabic Language Day, the Chairman of the Geneva Centre for Human Rights Advancement and Global Dialogue Dr. Hanif Al Qassim stated that the increased use of Arabic language worldwide will enhance intercultural understanding between Arabs and non-Arabs.